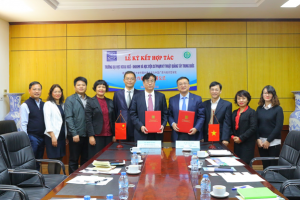 On November 28th, 2017, University of Languages and International Studies – Vietnam National University, Hanoi (ULIS – VNU) held the signing ceremony of the cooperation agreement with Guangxi University of Science and Technology (China). 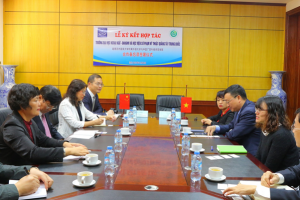 The ceremony was attended by Dr. Do Tuan Minh – President of ULIS, M.A Mai Van Hoa – Vice Director of Cooperation & Development Office, Dr. Nguyen Dinh Hien – Dean of Faculty of Language Education & Professional Development. From Guangxi University of Science and Technology, the delegation of 5 representatives led by Vice – president Chen Qiang took part in the ceremony. Guangxi University of Science and Technology (GSTU) is located in Laibin, Guangxi, China. The university has over 12.000 students and 663 lecturers. GSTU was established in 1958 and started applying the undergraduate education system in 2015. Education, Construction and Management are 3 main majors of GSTU. It is organized into 13 undergraduate colleges and 10 postgraduate programs and 43 undergraduate majors. At the ceremony, representatives of two universities signed the official cooperation agreement. 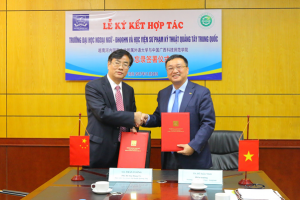 The two universities agreed to cooperate in teacher and student exchange, research, education, etc. In addition, the two universities discussed the strategic direction for prospective cooperation activities such as lecturer and student exchange as well as study tours. Additionally, two universities’ representatives promised to enhance the exchanges, cooperation and mutual understanding.